Through thick, awkward gloves, the astronaut can feel the sturdiness of the cold metal ladder beneath him. The sudden intensity of a droplet of sweat running down his temple makes him intently aware of his pulse, the precious oxygen shuttled 250 million miles for him to breathe, the weight of his legs after a year in space. Landing gently on brittle and foreign soil, he looks for a moment at the unfamiliar reddened sky, the blood-red rocks and rusty dust, the horizon so unnaturally close, and the hills so unnaturally smooth. Millions of miles from the seas and trees of his ancestors, the generations of brilliance that dreamed of this moment, and the world that now holds its breath, he can find only one word to greet the greatest adventure now beginning: Mars. Since the discovery of Mars, mankind has dreamed of its mysteries. Today, astrobiologists are probing Mars for signs of ancient life, planetary scientists are peeling back the planet's rust-stained layers, and the National Aeronautics and Space Administration (NASA) is preparing to fulfill the dream of generations of science fiction writers by sending humans to the Red Planet. Though no plans yet exist, plans for plans abound, and it is possible that a manned mission to Mars may be undertaken by the 2020s. The amount of technology needed for such a mission is foreboding to say the least, and we are still woefully unprepared for such a feat. Nevertheless, the missions that circle Mars today have been designed with human exploration in mind, and the robots heading to Mars in the future are intended in part to prepare us for human visits. A manned mission to Mars would require international collaboration. Despite this, NASA and the United States will most likely lead the effort in terms of funding, technology, and personnel. Before sending astronauts to the moon, NASA sent satellites, landers, and orbiters to scope out the lunar environment. Between 1958 and 1963, NASA successfully sent 4 fly-bys, 5 landers, and 5 orbiters to explore the moon. Today, we see the same flurry of missions launching off into space, but this time, to Mars. As you read this, two satellites are circling Mars with NASA stickers on their sides: 2001 Mars Odyssey and Mars Global Surveyor. Within the next year, the Mars Exploration Rovers and Mars Express (in collaboration with the European Space Agency) will be on their way to the Red Planet. The Mars Reconnaissance Orbiter is scheduled for launch in 2005, Mars NetLander (in collaboration with the French, Italians, and European Space Agency) for 2007, Smart Lander for 2009, and several scout missions are planned to go up between now and 2011, when a sample-return mission is planned. Much like the lunar missions of 1958 to 1963, each of these missions will play a vital role in providing NASA with the information they need to send humans to Mars. While orbiters and landers collect information about the planet, scientists back on Earth are working to solve the myriad problems that come with sending humans to another world. Engineers must develop a spacecraft capable of supporting humans for up to 21 months, rover technologies, human life-support systems for long-duration missions, human habitats for Mars's surface, and mechanisms to combat static electricity build-up, in addition to whatever scientific research they wish to carry out on the surface. Throughout the entire mission, the health of the astronauts will be in danger, and every danger must be planned and prepared for ahead of time -- NASA will only send humans into space if there is a 99% chance of the crew returning intact. Cosmic radiation, muscle deterioration, instrument failures, toxins in Martian dust, dangerous Martian terrain, unstable Martian soil, the poisonous Martian atmosphere, effects of microgravity, bone loss, static electricity buildup, insanity, chemical exposures . the list goes on, and NASA must prepare for each and every threat to human life. Additionally, a human mission to Mars will be so labor-intensive and expensive that it will require international collaboration. Estimates for the cost of a human mission to Mars range from $20 billion to $55 billion. Given the enormous costs, the looming engineering challenges, and the threat to human life, why should we send humans -- and not, say, robots -- to Mars? The usual answer is: to search for life. In 1999, the Mars Global Surveyor photographed gullies and tributaries on Mars - evidence that the planet was once home to torrents of liquid water. Combined with the controversy over the "bacterial fossils" found in Martian meteorite ALH84001, this has spurred a fresh new wave of research into the possibility of life on Mars. Despite the research, the question still remains: Was there ever life on Mars? Human explorers would be the best way to answer this question. Unlike robotic rovers, humans can travel long distances, dig and shift through Martian soils, delicately split open Martian rocks to look for fossils, and conduct systematic geological searches for evidence of life on Mars that rovers and robots simply cannot do. Searching for life below the Martian surface -- where many Mars scientists believe life may still be hiding out -- will require human teams, since available robots are unable to drill more than a few centimeters below the soil's surface. Author Glenn Zorpette corroborated this belief in a March 2000 Scientific American article: "Today the kind of robotic technology that can be delivered to another planet . is not really up to the demands of a game of croquet, let alone those of fossil hunting in a frigid, unstructured environment." Humans are more mobile, creative, efficient, and responsive than robots when it comes to planetary exploration. Whereas a human can make a decision in a split second, a robot much wait for instructions from Earth - instructions that take 40 minutes to travel between the two planets. In a 1986 study, NASA's Solar System Exploration Committee concluded that a robotic mission to the moon could have carried out exactly what the astronauts of Apollo 15 did, but it would have taken 155 times as long. Considering that today's robots are far more sophisticated than those of the 1970s, robots would need more than 3000 months (more than 10 years) of constant, uninterrupted exploration to accomplish what a human mission could accomplish in 20 months -- and even then the robots would come up short. Deciding whether or not go to Mars is the smallest of NASA's problems. Our ships aren't strong enough, our rovers aren't fast enough, our suits don't protect enough, and Mars is one dangerous place - but they're working on it. Mars is more than 200 million miles from Earth -- driving a Toyota, it would take you more than 350 years of continuous travel. Though current technologies would allow astronauts to reach Mars in 10 to 21 months, this is still an awful lot of time to spend in space. Out in open space, without Earth's atmosphere to shield them, the astronauts would be exposed to extremely harmful cosmic radiation from the Sun and from outside the Solar System. The more time they spend in space, without an atmosphere to protect them, the more likely it is that the astronauts will someday die from cancer. The longest anyone has spent in space is 438 days, aboard the Russian space station Mir. A Mars mission would be many times longer. At the Advanced Space Propulsion Laboratory of NASA's Johnson Space Center, physicists are developing the Variable Specific Impulse Magnetoplasma Rocket, a new type of rocket that will use super-heated plasmas instead of chemicals to propel a craft through space. This new rocket will allow humans to reach Mars in 3 months, and with payloads of more than 100 tons. Development of a full ship to transport humans to Mars is expected to take another 10 years. Astronauts bound for Mars will need more technological help than just a speedy spaceship. Rovers will probably be used for a variety of purposes during a manned mission, including carrying life support equipment for the astronauts. Current rovers move slowly and only for short distances -- the Mars Exploration Rovers scheduled for launch in 2003 will move at a speed of 1 cm/sec (0.002 miles per hour), and will only be able to travel 100 meters in one Martian day. A rover carrying life support equipment for an astronaut would have to be able to move at 130 times that speed and be able to transverse hundreds of kilometers. A rover expected to transport astronauts would have to move 440 times faster than current rover technologies. Such rovers would need tens of kilowatts of power in a compact form, and such concentrated forms of power do not exist yet. Despite this, rover technologies are zipping along at a brisk pace. Just five years ago, the Mars Pathfinder's rover was able to travel only 101 meters over the course of its 2,023-hour mission. The Mars Exploration Rovers will move in one day the distance Pathfinder moved in its whole life. The Smart Lander, which will land on Mars in 2008, will have long-roving capabilities and be able to maneuver with a kind of precision that previous rovers have not been able to muster. Though our technologies are not up to the task of human exploration yet, they are moving rapidly in that direction. Even assuming we develop rovers that are fast and strong enough, the regolith - the brittle Martian soil -- on which they will drive is unstable in places, and may reduce mobility, speed, and induce mechanical failures. Specifically, the sharp regolith may cause a flat tire at an inopportune moment. The regolith may also slow down rovers, which, in an emergency, could mean doom for astronauts seeking shelter or medical assistance. To help counter these problems, NASA is investigating rock distribution and shape, how abrasive the regolith is, how it shrinks, and how it responds to stress. The Mars Reconnaissance Orbiter, scheduled for launch in 2005, will tell NASA volumes about the Martian surface. With resolution good enough to distinguish a large cat curled up on the surface, this orbiter will help NASA pinpoint rock distributions and shapes at possible landing sites for future human missions. The Martian atmosphere will also pose considerable engineering problems for future astronauts. The Martian atmosphere is 95% carbon dioxide; however, this can be prepared for (after all, astronauts deal with no atmosphere every day). The real problem is static electricity. On Earth, walking across a carpet can produce enough charge to disable sensitive electronics. On Mars, there is no surface water, so there is no natural grounding mechanism. As a result, astronauts will develop huge differences in electrical charges relative to their equipment. This might produce an arc between the astronaut's space suit and equipment, meaning potential damage to sensitive instruments or the suit itself. Radiation will be a serious threat to human life during the exploration of Mars. Earth and Mars act as shielding planets so while on them the atmosphere, magnetosphere and planet themselves protect us from the immense radiation pouring down on us from space; however, in open space, weak galactic cosmic radiation will constantly bathe the astronauts. More time spent away from a shielding planet, like Earth or Mars, means more radiation, so faster spaceships will help reduce the amount of radiation astronauts encounter. Should the spacecraft or power supplies use nuclear power, the astronauts would need to be additionally shielded. Large doses of radiation have drastic effects on the human body. Immediately after exposure to radiation, a person may feel headaches, dizziness, and nausea, and may even experience severe illness or death if the dosage is high enough - any of these will make exploring Mars an unpleasant, if not impossible, experience. Months or years after exposure, a person may experience cataracts, skin damage, cancer, genetic damage, death of non-regenerative cells or tissues, damage to the central nervous system, infertility, or a weakening of the immune system. NASA is unwilling to send humans on any mission with a one in 100,000 chance of one of the crewmembers developing cancer, and the rest of these dangers pose serious problems for NASA to solve. The first step in solving the radiation dilemma is to determine the amount of radiation an astronaut traveling to Mars will be exposed to. The 2001 Mars Odyssey is doing just that. As you read this, MARIE (the Martian Radiation Environment Experiment), one of Odyssey's instruments, is mapping out the intensity of cosmic radiation raining down on Mars. By the time Odyssey finishes its mission, NASA scientists will know the nature of the Martian radiation environment, and will be able to design human space suits accordingly. In addition to the radiation, astronauts will undoubtedly inhale small amounts of Martian dust. Microscopic particles will be brought into the human habitat on instruments, space suits, and through any gap or opening. This presents us with a problem: We don't know what kind of stuff is in the Martian dust. All the information about the dust of Mars comes to us via Martian meteorites that have landed on Earth, and small measurements taken by Viking and the Mars Pathfinder. Assuming the worst, Martian dust may contain chemicals resulting in cancer or lung injury. Currently, 2001 Mars Odyssey is working on determining the composition of the Martian surface. Using its Gamma Ray Spectrometer, Odyssey is measuring the amounts and distributions of elements on the surface, including deadly elements such as beryllium. Its Thermal Emission Imaging System is busy creating a map of the distribution of minerals on and below the surface. Together, these two instruments will help NASA determine the composition and hazards of the Martian dust. To determine the composition of the Martian dust, a sample-return mission is planned for 2011. This mission will send a robotic rover to the surface of Mars to scoop up some Martian dirt and rocket back to Earth with the dirt in tow. Once on Earth, the dirt will be analyzed, tested, studied, probed, and examined with the usual scientific zeal. This will tell us what possible threats to astronauts the dust poses, and allow NASA to prepare for them. The gravity on Mars is 35% that of Earth's, and the gravity available during the deep-space mission to get to Mars will be 0% of Earth's. We still don't understand the full effects of long-term zero and microgravity on astronauts; however, we do know that short-term exposure to zero gravity results in muscle deterioration (at rates of up to 5% a week), bone-loss (up to 60% can be lost), loss of blood volume, heart atrophy, and extreme light-headedness. Russian cosmonauts who have spent months aboard Mir have had to be carried away from the return aircraft on stretchers, because they passed out on re-entry. This could mean death for astronauts trying to land a space shuttle back on Earth after a year's journey back from Mars. Bone-loss is a more long-term, but still serious problem. Studies have shown that a three- to four-month stint in space may require two or three years of recovery time for the astronaut's bones, and many never recover at all. A variety of astronaut exercise methods exist; however, none have produced conclusive, long-term results. Experiments aboard Skylab, Mir, and space shuttle missions are all adding information to NASA's growing knowledge of the effects of microgravity, but no one yet knows what a three-year journey will do to the health of even the most fit person. While intelligent life on Mars is unlikely to exist, it is possible that microbes still exist there, and, if they do, could be hazardous to astronauts. Of course, even if there are microbes on Mars, it is next to impossible that they have evolved into disease-causing agents that could survive in the human body, but that must be taken into consideration. Perhaps of greater significance is the possibility of backward contamination - bringing Martian microbes back to Earth. If astronauts were to come into contact with microbes, they would be immediately quarantined back on Earth. The microbes would not be adapted to living in an oxygen-rich atmosphere, and it would most likely kill them. Given current rover and robotic technologies, it is nearly impossible to use robots to determine if there is still microbial life on Mars. Astronauts will just have to be prepared to wait until they get there to find out. Getting to Mars is tough, and staying alive on its surface is dangerous, but getting back to Earth is just plain hard work. It will be almost impossible for astronauts to carry enough fuel for their roundtrip voyage - it is just too much weight. The astronauts will need to produce their own return fuel while on Mars. The problems with this are enormous, as we don't know how astronauts would produce the fuel or from what, where they would find the necessary materials, or even if they would be able to find enough material. There is also always the possibility that the astronauts would not be able to find the fuel they needed, and would be stranded on Mars - probably the most terrifying idea of the whole mission. Working on this problem right now is 2001 Mars Odyssey, which is using its Thermal Emissions Imaging System to map the distribution of minerals on and just beneath the Martian surface. With a detailed map of Martian minerals, scientists will be able to judge whether or not astronauts will be able to drill for return-voyage materials on Mars. Still in development but working toward this same idea is the team of the Mars In-Situ Propellant Production development project. They are working on a device that will help produce fuel from minerals on the Martian surface, and oxygen from carbon dioxide in the atmosphere. What Would a Manned Martian Mission Be Like? In between solving all the problems a human Mars mission brings with it, NASA must plan the actual mission: crew composition, living arrangements, and scientific research to be carried out on the surface. A manned Martian mission would consist of two phases: the long, deep space journey from Earth to Mars, and the time the astronauts spend on Mars. Between 10 and 21 months would be spent in transit, depending on the type of fuel used and when the launch occurred. The actual time spent on Mars would either be one to one-and-a-half months or 16-20 months. There are no other options, since Mars and the Earth are only aligned suitably during certain times. Once on Mars, astronauts would need to live somewhere. Designs for a human base are plentiful, and several are actually being tested. The Mars Society, a private group dedicated to encouraging the exploration of Mars, is building a replica of the human research base they have designed for Mars in Antarctica. Though NASA has not undertaken any development projects for habitats on Mars, it has been studying the effects of different living arrangements on astronauts aboard the space shuttle, Mir, and Skylab. Astronauts would carry out a variety of scientific missions while on Mars. The most obvious and pressing would be searching for life - microbial or otherwise - on and beneath the surface. They would also study the geologic history of Mars, in hopes of determining how and when Mars changed from a warm and wet world to the frigid desert we see today. The crews that work together best, according to studies on astronauts living in Mir, are composed of people with a variety of backgrounds. Most of the astronauts will be in their forties and early fifties, since that is the typical age of astronauts in their prime, and the crew would probably be a mixture of genders, nationalities, and backgrounds. Most plans call for a crew of seven astronauts, but smaller and larger crews are being assessed as well. The mission itself would probably call for at least one microbiologist, geologist, planetary scientist, engineer, doctor, and pilot, but what other professions might be represented is anyone's guess. Studies of groups of people wintering in Antarctica have shown that the most relaxed groups are composed of introverted, self-controlled people who take change with stride. Extroverts and overachievers who need every tiny thing to work out perfectly have quickly become stressed, depressed, and anxious. A well-developed Mars team would need at least one leader personality and at least one emotionally nurturing person, but not more than one of each, since that would fuel rivalry. Being stuck in a small, enclosed space with the same group of people for years on end is possibly the most dangerous to the astronauts' psychological well-being. As Russian cosmonaut Valery Ryumin commented after a long stay on Mir, "All the conditions necessary for murder are met if you shut two men in a cabin and leave them together for two months." The Russian and American astronauts who have spent months on Mir have returned with the uniform opinion that the most trying part of the entire experience was keeping themselves emotionally and psychologically calm. Aboard MIR and in controlled simulation environments, fistfights have broken out, and one female astronaut reports that she was nearly raped by a fellow astronaut. A Mars mission would be the most psychologically intense space mission ever planned. A group of about seven people would be confined to an area smaller than a 747 airplane for more than three years; there would be no chance of help coming to them once they had passed the orbit of the moon; after only a few days, communication with Earth would take so long that they would be able to communicate only via e-mail and voice mail; there would be no Earth to watch out the window during the long voyage, only the black depth of space; the crew would constantly be aware of the thin walls separating them from the vacuum of space; and, perhaps worst of all, the astronauts would be bored out of their minds for 10 to 21 months while they wait for their ship to reach Mars. Researchers at NASA and Dartmouth University are working on a computer program that will monitor the psychological standing of each astronaut, and give them psychological exercises to do throughout the journey. This so-called "silicon psychiatrist" would be much more effective than an actual psychiatrist on-board, since a human version would be subject to the same stresses as the astronaut. Computer scientists at the University of Pennsylvania are working on developing a computer program that would be able to recognize emotions on a human face: anger, sadness, stress, anxiety, pain - any emotion that might be a detriment to astronauts in space. 2001 Mars Odyssey, Mars Global Surveyor, Mars Exploration Rovers, Mars Express, Mars Reconnaissance Orbiter, Mars NetLander, Smart Lander, Mars In-Situ Propellant Production, scouts, and sample returns . all point directly to one conclusion: Humans will walk on Mars within a very few decades. Nobody in our solar system has seen this sort of intense focus of missions since the preparations for landing on the moon in the years before Apollo, and each and every mission listed above will help prepare NASA for landing humans on Mars. This is perhaps the most exciting time yet in the history of Mars exploration. With two powerfully successful missions orbiting Mars right at this moment, and at least seven more planned over the course of the next decade, it is very likely that humans will set foot on Mars within 30 years - possibly sooner. The challenges facing NASA and the world space community are enormous, but with each Mars-bound robot we launch, we come that much closer to understanding the Red Planet. When, preceded by dozens of robots, supported by thousands of studies, equipped with the most high-tech gear, that first astronaut steps off the ladder and takes a moment to look at the red sky and smooth dusty hills of Mars, it will be the greatest engineering achievement of our time, and our first tiny step into a new era for the human race. "2001 Mars Odyssey." National Aeronautics and Space Administration. http://mars.jpl.nasa.gov/odyssey/index.html. 5 May 2002. 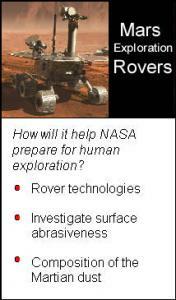 "2003 Mars Exploration Rovers." Future Mars Missions. http://mars.jpl.nasa.gov/missions/future/2003.html. 7 May 2002. Aeronautics and Space Engineering Board and Space Science Board. Safe On Mars: Precursor Measurements Necessary to Support Human Operations on the Martian Surface. 2002. Bell, Trudy and Tony Phillips. "Once Upon a Water Planet." Science@NASA. 12 March 2002. http://science.nasa.gov/headlines/y2002/12mar_waterplanet.htm?list540155. 5 May 2002. Chang-Diaz, Franklin. "Propulsion: Newton's Rocket." NASA: Human Spaceflight. 8 May 2002. http://spaceflight.nasa.gov/mars/technology/propulsion/. Citizens Against Government Waste. 5 May 2002. www.cagw.org. "Exploring Mars and Beyond." NASA Human Spaceflight. 10 May 2002. http://spaceflight.nasa.gov/mars/. "Human Crew: Requirements." NASA: Human Spaceflight. 10 May 2002. http://spaceflight.nasa.gov/mars/human_crew/requirements/. "Human Exploration and Development of Space." Office of Space Flight. 10 May 2002. http://www.hq.nasa.gov/osf/. "Mars Express." European Space Agency. 6 May 2002. http://www.sci.esa.int/marsexpress/. "Mars Global Surveyor." National Aeronautics and Space Administration. 6 May 2002. http://mars.jpl.nasa.gov/mgs/. "Mars In-Situ Propellant Production." NASA: Human Spaceflight. 9 May 2002. http://spaceflight.nasa.gov/mars/technology/mipp/overview.html. "Mars Microrover Telecommunications." National Aeronautics and Space Administration. 7 May 2002. http://mars.jpl.nasa.gov/MPF/rovercom/rovcom.html. Miller, Karen. "Gravity Hurts (So Good)." Science@NASA. 2 August 2001. http://science.nasa.gov/headlines/y2001/ast02aug_1.htm. 9 May 2002. "Missions to Mars." NASA: Solar System Exploration. 7 May 2002. http://solarsystem.nasa.gov/missions/mars_missns/. Space Studies Board. The Human Exploration of Space. National Research Council: 1997. Weed, William Speed. "Can We Go To Mars Without Going Crazy?" Discover. May 2001. Zorpette, Glenn. "Why Go To Mars?" Scientific American. March 2000.